Welcome to the Ten Percent Legal Recruitment information page for Chester. We are probably biased when writing about Chester and make no apology for this. Our North Wales office is situated about 15 miles from Chester and it is our local city! If you would like to contact us for further information about posts, please either view our vacancy database, or email us at cv@tenpercent.co.uk. 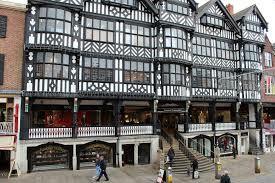 Chester – a thriving city with extensive shopping opportunities. Chester, a historic walled city on the border of Wales and England, is a vibrant place that was founded by the Romans over 2000 years ago. In every corner of the city you will be confronted with history, nevertheless Chester manages to combine historic Roman architecture with modern day living hosting a dynamic mix of shops, pubs, clubs and restaurants throughout the city. Today the city is flourishing in the retail and tourist sectors and holds the title of the first Fair Trade city in the country (although every town and city seems to have jumped on that bandwagon in recent times!). We can thoroughly recommend spending a weekend in the city – there is plenty to do and it is a great destination for a weekend away. In fact, combining a visit to Liverpool and Chester would give you a really action packed weekend.. Watch out for the Romans – you can’t miss them. What does Chester have to offer? Chester Cathedral – most splendid indeed! 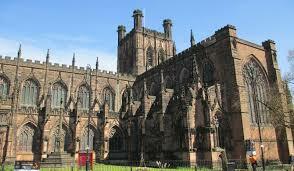 Chester Cathedral attracts thousands of visitors every year – and if you visit you can see why. The cathedral is an outstanding building and is home to the most complete Medieval monastic complex still standing in the UK. Chester Rows – beautiful and Victorian! 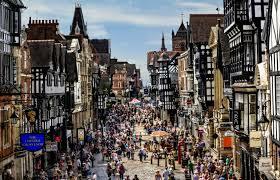 Chester’s main streets are home to the Rows – potentially about to be listed as World Heritage Site. Best described as a two tier shopping gallery, parts of it date back to medieval times, although a fair bit of it was stuck on by the Victorians! It is one of the most impressive sights in the city and hosts many standard chain stores as well as a variety of independent boutiques. The two main shopping centres in Chester are The Grosvenor Shopping Centre (next to the Grosvenor Hotel – a 5 star dead posh hotel with a Boodles jewellery store on the corner complete with bouncers to keep out the commoners) and The Forum Shopping Centre providing indoor shopping in accessible locations, although the Forum Shopping Centre is not the nicest. It does however lead through to the Indoor Market and this is worth seeing. You will also find Browns of Chester (Debenhams) in the heart of the city, a five floor department store of fashion, beauty and homeware. The architecture in here is interesting – it is built on top of one of the original crypts which is the stone section of the Rows. There is also a very strong tradition of markets in the area and at present Chester Market, which dates back to the 12th Century, is home to over 70 shops. To find out more information visit www.chestermarket.com/. 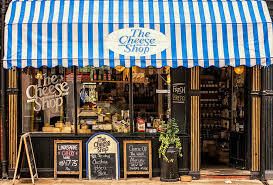 A special find for cheese lovers, The Cheese Shop!! This special delight can be found inside one of city’s main gates and is a family run business going back over 20 years. It is crammed full with over 100 British cheeses and is a favorite haunt for tourists and locals alike. Chester Cheese Shop – highly recommended. If you fancy a short trip outside the city check out the Cheshire Oaks Designer Outlet with over 140 shops offering discounts of between 50 – 75% off. What the discounts are off exactly is another matter – personally apart from Clarks for cut price school shoes for the kids I have never found any bargains at all here… For more information check out www.cheshireoaksdesigneroutlet.com. You will never be short of something to do in and around Chester. 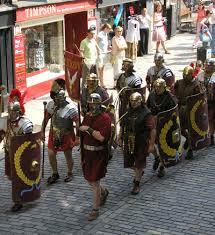 Firstly, look out for Romans – they are literally everywhere, marching around the city shouting in Latin! Romans – everywhere – shouting in Latin and generally being a nuisance in Chester City Centre. Chester Boat River Cruises – This is the ideal way to take in the beauty of Chester. You can choose between a short 30 minute cruise or the longer 2 hour cruise, both offering hot and cold drinks on board the showboats, The Lady Diana and Mark Twain. My daughter loves these cruisers – she sails further upstream and regularly has to avoid collision as they come steaming up the River Dee! It is a lovely place to go for a quick cruise if you get the chance. If you are interested in finding out more check out their website www.chesterboat.co.uk/. This aquarium offers a journey through deep sea waters of the Caribbean. Home to over 450 species of fish and other marine life as well as 20 different species of sharks. However we have always thought this attraction is unbelievably and quite eyewateringly expensive for what it is – an aquarium. Try the Seaworld in Rhyl for a cheaper aquarium – its only 45 minutes up the A55. For more details check out www.blueplanetaquarium.com/ . This is almost certainly the best Zoo in the world, probably. We have enjoyed annual membership of the Zoo for over 10 years and it gets better every time you visit. The zoo continually upgrades its attractions and I have to say it is the only zoo I have ever been to where I haven’t felt sorry for the animals. Chester only keep endangered species in captivity and take part in breeding and conservation programmes around the world. 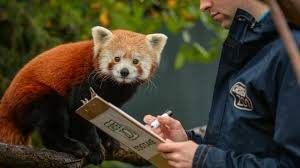 I can guarantee that you will not get round the zoo in one visit – there is absolutely loads to see and do. Thoroughly recommended. The food is not bad – but they also cater for packed lunches with an indoor picnic area. See www.chesterzoo.org/ for more information. The bus links from central Chester are very reliable – they go from the station and the city centre and drop off inside the zoo. Chester Zoo – thoroughly recommended for a visit. Lots to do and reasonably priced. The Roodee in Chester is the oldest racecourse in Britain and a glorious social occasion. With thirteen race days during the year everyone should allow a flutter for a truly unforgettable experience. In August there is a family fun day as well as other various events including Ladies night, a Roman Festival and the Dee Festival. For more details check out www.chester-races.co.uk. Chester and its surrounding areas have some of the most beautiful parks and gardens in the North West. Grosvenor Park and Alexandra Park are properly the two most famous parks hosting a range of tennis courts, green bowling areas as well as a children’s play area and plenty of open space. Westminster Park similarly has a very expansive cycle track and a 9 hole pitch and putt golf course. (incidentally you may have noticed a lot of references to the words Grosvenor and Westminster around Chester – this is because the Duke of Westminster has his palatial home – Eaton Hall – just up the road, and owns half of Chester City Centre via an offshore trust – see Private Eye for exact details). Eating – The city offers worldwide cuisine including French, Italian, Latin, Chinese, Indian, American and Mediterranean as well as a number of traditional British eateries. Hanky Panky Pancake House is a must visit – excellent cuisine at a reasonable price. Night Life – Chester is full of unique bars and pubs offering something for everyone. A family run bar/restaurant and an internationally renowned music and arts venue with an impressive selection of European beers. It is located on the canal basin with a feature glass wall providing wonderful views overlooking the water. By Road – Chester is well served by the road network and is readily accessible from the M56 or M53 motorways. It is also close to the A55 which allows for easy access to North Wales. The Welsh coastline can be reached within 35 minutes (Rhyl is about 45 mins) while a journey into Snowdonia will only take around an hour. The two major cities of Liverpool and Manchester are also easily reached from Chester with the journey times taking 20 minutes and 40 minutes respectively. By Train – Chester Central, situated to the north-east of the city, is the main train station serving the city centre with services to and from all the major UK cities. It is currently operated by Arriva Trains Wales, although Merseyrail, Northern Rail and Virgin Trains also run services there. By Air – Manchester International Airport is a major UK airport, 30 miles from Chester while Liverpool Airport is a smaller international airport, 25 miles from Chester and can be reached in 35 minutes by road. Chester has an airport – sort of – Hawarden Airport is in the middle of the Airbus factory at Broughton, about 4 miles from the city centre, although it tends to be used by Airbus, executive jets and flying celebrities. Michael Owen lives in Northop (about 7 miles from Chester) and regularly flies over the golf course just as I am about to take a shot. According to a national survey, Chester is one of the best places to live in the UK with 92% of people saying they liked living there and 94% saying their quality of life is good or very good. Some of the top ten reasons to live in the city include good education, jobs, housing, suburbs, culture and heritage. Whether you are looking for a trendy luxury apartment or a large family home, the city boasts top quality property. The most popular properties in Chester are terraced houses. Most of the sales in Chester are terraced properties which on average sell for £176,619. In 2016 semi-detached properties had an average sold price of £209,498 and detached properties averaged at £345,684. There are around 35 estate agents covering the Chester area and approximately 21 letting agents. If living outside the city is more up your street Chester is surrounded by many villages and towns all within a short drive of the city. The village of Tarporley is found south east of Chester and is one of the larger villages in the heart of the Cheshire countryside. The village has an excellent shopping centre with antique, craft and fashion shops. Frodsham is a charming Market Town and was winner of Best Kept Village Award in 2001, 2006, 2007. It is famous for its wide streets and large market every Thursday. NB: If you cross the border into Wales and head south or west out of Chester, house prices drop to much more affordable levels. Part of the legal world in Chester is the two Universities based in the city. Chester has its very own University. I seem to recall it was a College of Further Education until not that long ago, but in recent times it seems to have been taking over the local housing market and building blocks of student flats faster than the blink of an eye. www.chester.ac.uk. The University has two campuses, one in Chester and the other in Warrington. The Chester campus is the primary location of undergraduate teaching for a range of courses in the Humanities, Social Sciences, Applied Sciences, the Arts, Teacher Training, Nursing, Midwifery and Law. The University of Law (aka College of Law) is situated a couple of miles outside Chester in a very picturesque village called Christleton. Goodness knows what the residents make of inebriated law graduates staggering back to campus after a night on the tiles in Chester city centre. Christleton is one of the most expensive parts of Chester to live in – seems to be more than housing that is expensive in the village then! The University of Law is of course famous for its Legal Practice Course and Graduate Diploma in Law, or whatever the current reincarnation is when you read this article. It is not a cheap route into the legal profession by any stretch of the imagination. University of Law, Christleton Hall, Christleton Chester CH3 7AB Tel: 0800 068 0053. So far as legal work is concerned, the vast majority is similar to other cities and towns of a similar size – 70,000 people work in Chester. So you can find the usual mix of high end private client and business law firms coupled with smaller high street outfits and the occasional branch office of some giant behemoth. Cheshire’s unemployment is consistently below that of the North West and the rest of Great Britain and you could sum up Chester in one word: “posh”. This means that there are plenty of solicitors firms servicing the money. The city has a thriving legal services sector and is home to several top practices as set out in The Legal 500. Aaron & Partners LLP is a leading firm with offices in Chester and Manchester. They have been recommended by both Chambers and Partners and the Legal 500 for the legal services they provide to their clients. The firm focuses on three key areas; Business Services, Real Estate and Private Client. This firm has been recognised in The Legal 500 as having particular expertise in agricultural and family law. The Chambers’ Directory also recognises their prominence in agricultural law. WSW Solicitors have over 170 staff in their two offices in Chester and Wrexham, including 32 Partners. The firm was established over 150 years ago but prides itself on a modern and progressive approach when serving their clients. Naturally they are no longer called Walker Smith Way and are Slater & Gordon, confusing a lot of locals in the process as until recently they were advertising on the local radio stations under their old name..
Nicholas Street Chambers is the longest established set of chambers in Chester and with currently 36 members it is the largest set of Chambers in the city. There are a good number of high street practices dotted around the suburbs and further afield – with the usual mix of litigation, property and private client. It is common knowledge in the area that if you cross the border into Wales and visit a solicitors firm in Mold for example, your legal fees will drop by about 33%, possibly more.. Salaries tend to be highest in Chester city centre, but the area surprisingly is not known for high salaried roles, even though Chester is an affluent area. Liverpool and Manchester solicitors firms traditionally pay better salaries and offer more lucrative career moves, although if you have ever commuted along the M56 to Manchester or through the tunnels into Liverpool you would probably appreciate why solicitors do not seem to mind the lower income. Cheshire County Council employs over 25,250 staff, including teachers, local government officers, youth workers, nurses and civil engineers etc.